Speed Camera Hypothecation Is it a grubby dash for cash? 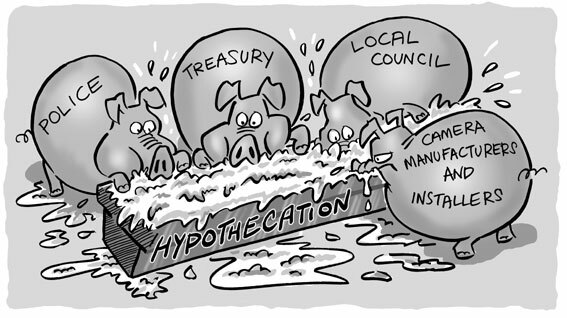 Who is feeding greedily at the trough? Members of the sickeningly named safety camera partnerships can now reclaim fines money from the treasury to cover their "costs". We'll use the accurate abbreviation "Scamera Partnerships" from now on. This scheme has been called "cash for cameras", "netting off", and "hypothecation". 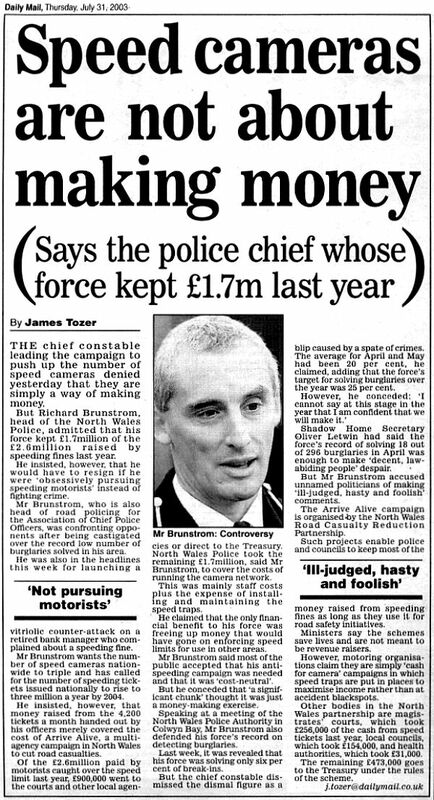 Let's say an imaginary Police force used to spend £1 million per year on road safety. They join a Scamera Partnership and their budgets remain the same. They claim the £1.5 million that their Scamera activities cost and they spend the £1 million that they used to spend on road safety on something else. Their Scamera activities have increased their income by £1.5 million. It works the same with councils. The Scamera money replaces money that they had previously allocated and frees off money for other activities. The more schemes they can claim are road safety related the more they can claim back, and the more money gets freed off. At the treasury it's just bonus money. Anything left over after the claims are paid is more cash for a high spending and inefficient government to fritter away. You might think that this cash could reduce the burden of overall taxation, but in treasury terms it's really only peanuts. Some of the very big winners are the Scamera manufacturers, installers and contractors. They are private companies spending public money and we bet they are doing very very nicely thanks at the public's expense. Is it all about revenue? Many people have complained that speed cameras are "all about revenue". We are disappointed to have to point out that this simply isn't the case. With perhaps £150 million pounds on its way to the treasury this year from speeding fines it is easy to assume that a great deal of money is being made. But it must be considered in context. With 30 million vehicles paying over £150 each year on average in vehicle excise duty alone the treasury receives something over £4,500 million pounds per year. If speeding fines were about treasury revenue an increase of just £5 in VED would bring them about the same amount of money without the expenses of operating the cameras, the courts and the rest. Clearly the issues are more complex. One factor causing the dash for cash is that at the local level they sometimes think they can get "road safety for free" by paying for it from speeding fine revenue. We're sure "road safety for free" sounds good to councillors and Police with limited budgets and many demands. But the "free" road safety is next to useless - in fact it seems to be worth exactly what the councils and police are paying for it. Then let's look at a range of vested interests. We wouldn't expect speed camera manufacturers, installers or importers to widely publicise "speed cameras are crap" would we? In fact we're sure they spend a great deal of money trying to convince Scamera Partnership that their cameras will reduce casualties. So the manufacturers have a vested interest in selling the cameras to Scamera partnership who in turn only exist because of the money from fines. The folk at the Scamera Partnership have to justify their jobs to council and police administrators. And the DfT lubricates the whole process with some quite hopeless and highly simplistic road safety information. We don't have any idea why the DfT lubricates the process. Perhaps they have limited thinkers with deeply held beliefs about the dangers of "speed"? The Scamera Partnerships are non-profit making empires. Managers can build their empires and increase their personal power. Within limits, the more they spend, the more they can claim back. And crucially, if they can catch more drivers they automatically have the finance to do so. It pays the empire builders to catch drivers and not alter behaviour. We shall be monitoring carefully for evidence of empire building from any source, and we will report everything we can here. It seems that fines imposed in Court must go to the treasury and stay there. See the quotes (here). Now if the Scamera Partnership get no cash from a fine imposed in court, you might think that was one more reason to demand your day in court. Paying the fixed penalty enables the empire building. We've already seen how the Speed Camera manufacturers are likely to maximize their claims of benefits. And it should be quite obvious that councils and police forces who have travelled down the speed camera route are likely to work quite hard to justify their decisions. But what about the public? Can't they see through the lies? Not if the Scamera Partnerships do as they are told and spend millions on spin and publicity. RECOMMENDATION: "New areas joining the system should aim to allocate a proportion of the income (say at least 5%) from speed and red-light cameras to fund public awareness and communication programmes." (page 7-1) Let's just think about that for a minute... The operating costs for the 2 year pilot (in only 8 out of about 40 UK areas) were almost £21 million. They are saying that at least £1 million pounds must be spent on convincing the public that the cameras are a good idea. When the scheme is nation-wide, we should probably assume that they recommend spending at least £5 million per year to try to maintain the illusion. This is spin gone absolutely spiral. So let's get this right. They're saying that the public will be against them unless they employ professional liars; sorry; spin doctors at a cost of millions of pounds to convince the man in the street that it's a good idea really. We hear that all except Durham will be in the scheme by the end of the year. new Does hypothecation improve road safety? No, of course it does not. We compared figures from the 8 original trial counties over the period 2000 to 2002 with those counties who didn't join until 2003. What did we find? The counties that were not in the Scam returned better results than those that were in it. It's extremely worrying that the 8 failed to show any KSI improvement in the second year - (actually -0.5% but well under a significant threshold) We would not be surprised if many Scamera partnership areas completely fail to show any improvement in their second years as the flawed policies begin to bite - and this against a long term UK-wide improvement of better than 5% per annum (resulting from road, medical and vehicle safety improvements.) They must do really badly to destroy this trend - they must make the roads more dangerous by 5% to overcome the ongoing improvements mentioned. We're not surprised to see that the scamera partnerships did badly, because speed cameras clearly cannot make the roads safer. Surely the difference between -5.18% and -7.05% isn't very great is it? Suppose we try reducing the 8 counties year 2000 figure by 7.05% they might have achieved in 2002... That's 7,559 * 92.95% = 7,026. But the actual figure was 7,137. So 7,137 - 7,026 = 111 extra killed or seriously injured persons in the 8 hypothecation trial areas in 2002 alone.